Walk into Half Moon Bay couple Jennie and Josh Book’s house and you’ll notice the abundance of color, from the cartoon decals on the wall above the back door to the children’s drawings that hang above a play space in the corner of the room. The playful color scheme corresponds well with their professions; Josh Book is an animator who has worked for the children’s television channel Nickelodeon, and Jennie is a writer who has authored two children’s books. Now, the couple is combining their livelihoods into one new venture: creating interactive storybook apps out of Jennie’s books, “Mr. 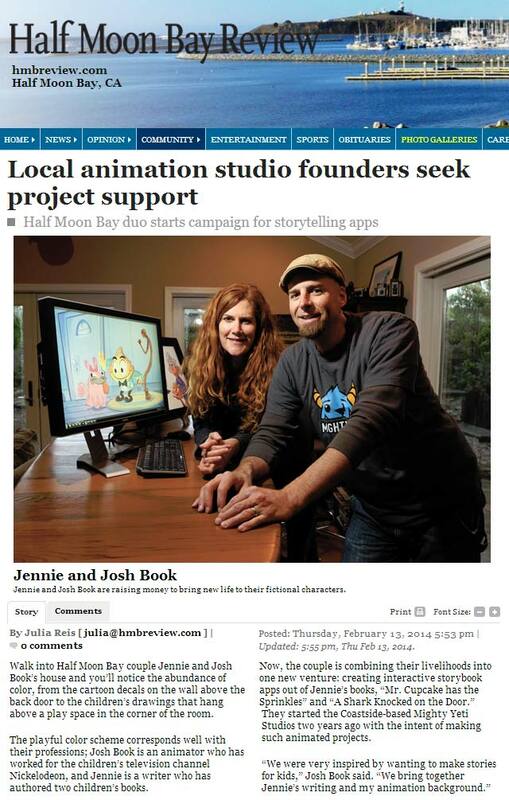 Cupcake has the Sprinkles” and “A Shark Knocked on the Door.” They started the Coastside-based Mighty Yeti Studios two years ago with the intent of making such animated projects. The couple said seeing their children, who are 6 and 4 years old, using tablets also influenced them to tap into the interactive storytelling app market. Interactive books are accessible digitally and differ from ordinary stories in that their readers can impact the world of the characters by touching an object in a particular scene. For example, Josh Book plans to animate one section of “Mr. Cupcake has the Sprinkles” so that if a child touches Mrs. Cat, who is Mr. Cupcake’s dog, Mr. Cupcake will pet her and she will wag her tail. Another element that the Books hope makes their app stand out is that it will be narrated in English and Spanish, which they believe will appeal to Spanish-speaking families and those who want their child to learn another language. Jennie Book wrote the two children’s stories a couple years ago. The first “A Shark Knocked on the Door” was inspired by her mother and the Books’ son, who sail boats down the gutter after a storm. In the book, their boat disappears down the sewer but is returned by a friendly shark, who takes them on an adventure. The second book is about a talking cupcake that tries to identify a maddening crunching sound in his house. The books were illustrated by Roman Laney and Eddie Betancourt, respectively. “Kids will think it’s goofy and totally love it, and I think parents will love it, too,” Jennie Book said. In order to gain the financial support needed to make these interactive apps, the Books recently turned to the online funding platform Kickstarter. At last check, they were halfway to their $12,000 goal, which they need to meet by Feb. 27. That money would help the couple with software licensing, actors for characters’ voices and narration in English and Spanish, sound effects, and paying licensing fees for music. Those who donate will receive public kudos and complimentary gifts ranging from computer and smartphone wallpaper for a $5 donation to rare print copies of the books with a signed sketch inside for a $250 backing. The Books are looking to have the apps available for download by April. “We hope they come back to Yeti as new stories come out, and with continued support we hope to make more of them,” Josh Book said.